Gas Tungsten Arc Welding (GTAW) and Plasma Arc Welding (PAW) applications are some of the most stringent in the welding industry. Whether you are welding products for the Aerospace or Aviation industry, welding tube or pipe in mills or welding pressure vessels, torch to work distance is a critical aspect of the process to create quality welds and maintain productivity. The torch to work distance is critical to maintaining consistent penetration and power (heat) into the part. Precise control of the torch height is the true function of our AVC-5 Arc Voltage Control System. In precision Gas Tungsten Arc Welding (GTAW) and Plasma Arc Welding (PAW) applications, our AVC-5 Control system maintains a consistent torch to work distance by monitoring the arc voltage and adjusting the torch up or down. Arc voltage and the torch to work distance are proportional, i.e., if the torch to work distance increases, the arc voltage also increases. By monitoring the arc voltage and comparing it to the preset desired welding voltage, the AVC-5 Arc Voltage Control system can precisely control the torch height. The AVC-5 Arc Voltage Control System has an accuracy of ± 0.1 volts, providing accurate and consistent torch to work distance. This high accuracy compensates for tungsten erosion on long automated applications, like tube and pipe mills, keeping the weld penetration and heat input consistent throughout the length of the weld. Because of the high demand for throughput from a tube or pipe mill, where welding speeds are quite often in excess of 10 feet (3 meters) per minute, the AVC-5 system removes the torch to work distance responsibility from the operator. As welding technology advances and weld speeds continue to push the envelope, our AVC-5 System will be at the forefront to maintain torch height accuracy. AVC-5 Control unit features a microcontroller-based unit with advanced capabilities in a simple-to-operate package. Capable of welding in AC and DC applications, the system can be used to weld mild steel, as well as many alloys. The system is hardened against High-Frequency damage and can be used in continuous High-Frequency (HF) AC welding applications. In addition to High-Frequency (HF) Arc starting capabilities, the AVC-5 System offers non-HF starting method known as Lift-Start, taking full advantage of newer welding power source’s technologies. One control unit works with either of our AVC drive assemblies. Our standard drive assembly is our most common drive with 6.5 inches (16.5 cm) of stroke with a 40 pound (18 kg) lifting capacity, it stands up to the harsh GTAW and PAW welding environments. When physical constraints exist in your welding area and our standard AVC Drive assemblies doesn’t fit, our Compact AVC Drive Assembly will. The Compact AVC Drive assembly is designed to fit inside of pipe and other small areas, such as a weld box on a tube mill. Our Compact AVC Drive Assembly is capable of also lifting 40 pound (18 kg), but with a much smaller stroke of 1 inch (2.54 cm), making it ideal for tight spaces. 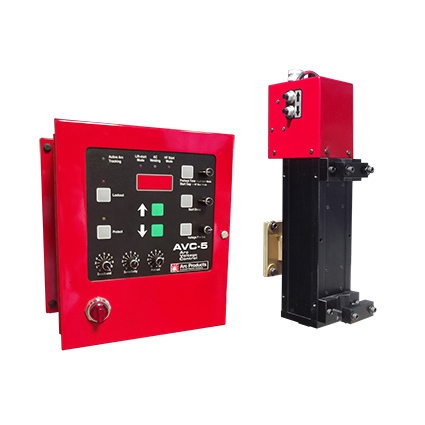 The AVC-5 Arc Voltage Control system can be configured to become the master weld sequence controller for a welding station—controlling the welding power source, carriage control / rotation device, and other components of the welding station—eliminating the need for costly PLC equipment and programming. By adding our AVC-5 system to your existing equipment, you can obtain higher welding speeds and better weld quality with a relatively small capital expense which typically pays for itself in 6 to 8 months.